My suitcases are (almost) packed and soon I will be heading back to Europe as part of my sabbatical this year. And, the lectures that I will be giving on supply chains as well as a short course on humanitarian logistics and healthcare are prepared and I am very much looking forward to giving them. I am bringing a few copies of our new book, "Networks Against Time: Supply Chain Analytics for Perishable Products," just published by Springer Business and Science Media New York, to give to my hosts at the School of Business, Economics and Law at the University of Gothenburg in Sweden and to also donate a copy to the library. 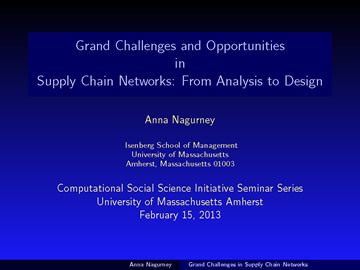 On Monday, March 4, 2013, I will be presenting a seminar, "Grand Challenges and Opportunities in Supply Chain Networks: From Analysis to Design," at the Chalmers University of Technology, which is also in Gothenburg. This seminar is part of the Optimization Series. I will have a week to meet with my wonderful colleagues and the students in Gothenburg and then I will be off to Vienna, Austria, where I will speak on one of the themes of our new book: "Perishable Product Supply Chains in Health Care: Models, Analysis, and Computations," at the Vienna University of Economics and Business. The title of my talk in Vienna, which is part of the research seminar series of the Research Institute for Supply Chain Management is: "Perishable Product Supply Chains in Health Care: Models, Analysis, and Computations." I have several wonderful colleagues there, including Professor Manfred Fischer, and my former doctoral student, Professor Tina Wakolbinger, who recently visited us at the Isenberg School and also took part in the AAAS Sympsoium on Dynamics of Disasters that I organized and which took place February 17 at the Hynes Center in Boston. While in Vienna, I will also teach an intense course on Humanitarian Logistics and Healthcare. I am told that the students who have registered for my course are from many different countries so this should be a very interesting and timely course. Congratulations to the Newly Elected 2013 RSAI Fellows! I was delighted to receive the great news below, which is also posted now on the RSAI (Regional Science Association International) website. The Fellows Award recognizes distinguished scholars in Regional Science. I know each of the scholars below and saw Professor Capello and Professor Thill at the NARSC meeting in Ottawa, back in November. Professor Puu I have known through his work with Professor Martin Beckmann, who was on my doctoral dissertation committee at Brown University, and is renowned for his book, "Studies in the Economics of Transportation," and other research. At the INFORMS National Meeting in San Francisco in 2005, I organized two sessions to mark the 50th anniversary of the publication of this great book and the presentations and many photos can be accessed here. I had met Professor Puu in Umea in Sweden years ago. Professor Kobayashi and I had spent, along with several others, including Professors Geoff Hewings, Takayama, Johansson, a magical few weeks in Mallacootta, Australia at a regional science workshop. As for Professor Thill -- he did some behind the scenes work, I was told by Professor David E. Boyce, to arrange the schedule at the NARSC Ottawa meeting so that I would be at the awards luncheon at which my receipt of the 2012 Walter Isard Award for Scholarly Achievement was announced. I had no idea that I would be the recipient and, coincidentally, Professor Bill Anderson of the University of Windsor in Ontario (I was born in Windsor) gave me this award and he had been in Umea when it was announced that Professor Jacques Thisse and I were the recipients of the Kempe Prize (also a complete shock to me and I fainted). I look forward to celebrating with the 2013 Fellows at the 60th NARSC Conference next Fall in Atlanta! Roberta Capello is professor in Regional and urban economics at the Politecnico of Milan. Past-President of the Regional Science Association International (RSAI). Editor in chief of the Italian Journal of Regional Science and co-editor of Letters in Spatial and Resource Science (Springer Verlag). Editor in chief of Papers in Regional Science from RSAI. Author of many scientific papers and a textbook in Regional Economics, published in Italian and English. Kobayashi is the recipient of several awards and prizes for his research including the Hinomaru Prize in 1988, the JSCE (Japan Society of Civil Engineers) Research Prize in 1993, 2001 and 2007. In 2007 he was included in the Top 50 City Creators and Urban Experts of the Ministry of the Environment of Denmark. From 1978-1986, Kobayashi was a Research Associate in Graduate School of Engineering of Kyoto University. In 1987 he became an Associate Professor at the Department of Social Systems Engineering at Tottori University, where in 1990 he became a full time Professor. In 1996 he returned to Kyoto University as a full time Professor at the Graduate School of Engineering. In 2007 he became the Vice Dean of the Graduate School of Management of Kyoto University and in 2009 he became the Dean. Tönu Puu, born in 1936 in Tallinn, was Professor of Economics at Umeå University from 1971 to 2001. Afterwards he worked at the Centre for Regional Studies (Cerum) for ten years. In total, he has published twenty books and 130 scholarly articles in economics, mathematics and philosophy. Jean-Claude is Professor of Public Policy, University of North Carolina at Charlotte, USA. He has previously held positions at SUNY - Buffalo, the University of Georgia, Florida Atlantic University and the Université Catholique de Louvain in Belgium. He has also served NARSC superbly for many years in many administrative capacities. His research has centered on the spatial dimension of mobility systems and their consequences on how space is used and organized in modern societies; statistical and computational methods of spatial analysis; and most recently urban land-use dynamics. I am so looking forward to being back in Sweden later this week as part of my sabbatical! 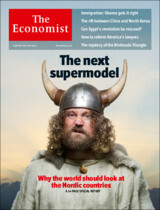 Perhaps you saw the recent special report, The Next Supermodel, on the Nordic countries in The Economist, February 2-8, 2013 issue. I enjoyed reading the follow-up Letters to the Editor on this report, as well, especially the one from Jens Baunsgaard from Bornholm, Denmark that said: SIR – Thanks for a very interesting special report about the Nordic countries. However, I must correct you concerning your cover photo: the Vikings never had horns on their helmets. It was Carl Doepler, working for Richard Wagner, who invented horned helmets for the Nibelungen Ring. The myth has been common since then. As an academic, with associations in this region for over a decade, especially Sweden, I marvel at the visionary perspectives of this region, especially its emphasis on and appreciation of environmental sustainability, which I thought was not noted sufficiently in the special report. As a Visiting Professor at the School of Business, Economics and Law at the University of Gothenburg in Sweden, thanks to an ad in The Economist that I responded to, I continue during my stays there to be transfixed by the trams, trains, busses, much utilized, and the pedestrian walkways under foliage and next to bicycle lanes, and the continuous improvements to the infrastructure, even with seasonal flower plantings. The citizens love the outdoors, their parks and their mobility, so that even the restaurants and cafes provide blankets for customers who wish to dine al fresco. Every time that I return back to the US I say "Why can't the US be more like Sweden" and the special report provided concrete evidence on how public-private partnerships that support innovations can excel and how people can work and live truly well. Business School Profs are dynamic. Some do fundamental theoretical work, others make more applied contributions, but all who conduct research write and speak about their observations and discoveries. The reputation of any school, including a school of business or management, rests on the caliber of its faculty and that of the students that it graduates. Some business school profs also write books. These might be of a technical nature, depending on one's discipline, or meant for a popular/mass audience. Below are photos of (some of the) books by Isenberg School of Management authors that are displayed in our school. 5 of my books are featured. For a fairly recent list of books authored by Isenberg faculty, see the webpage on the school's website. 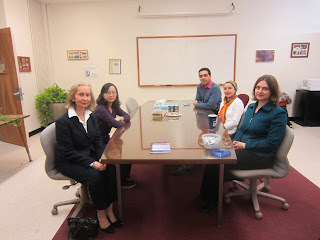 Min received her PhD with a concentration in Management Science at the Isenberg School last May and is now a Professor at the Pamplin College of Business at the University of Portland, and Amir recently successfully defended his doctoral dissertation. I was their dissertation advisor. As for Dr. Ladimer S. Nagurney, his college has already started to celebrate the publication of our book. This was a great collaboration, which the Isenberg School helped to bring together. Leadership comes in many forms -- scientific, political, intellectual, academic, business and industry, professional, artistic, and societal from the individual to the familial levels and beyond. Great leaders have courage and integrity and, through their vision and ability to capture the imagination and support of others, can elicit fundamental change. Being a great leader is never easy and one can experience isolation, marginalization, and even discrimination -- it is the work and novel ideas that matter and the documentation of them. Great leaders care about others and, under what, at times, may seem to be too many constraints, create opportunities and long-lasting effects. You may become a great leader even if your own organization, for whatever reasons, does not understand or appreciate your contributions. Leaders help to build communities. There is a lot of renewed interest in women and leadership lately with the new PBS production that starts airing next week entitled: Makers: Women Who Make America to Sheryl Sandberg's forthcoming book, Lean In, with a provocative article in The New York Times: A Titan's How-To on Breaking the Glass Ceiling. Sandberg is the Chief Operating Officer of Facebook. One of my favorite communities is WORMS -- Women in Operations Research and the Management Sciences. WORMS is a forum of INFORMS (Institute for Operations Research and the Management Sciences). To advise the INFORMS Board on aspects of issues facing women in the profession of operations research and the management sciences and to keep the INFORMS Board apprised of developments in this area. WORMS organizes great activities and also recognizes those who have contributed significantly to the advancement and recognition of women in the field of Operations Research and the Management Sciences (OR/MS) through the awarding of the WORMS Award. Recently, we received the message below, which announces the immediately past and incoming new WORMS Officers. Please remember to renew your membership for 2013 and let us know if you have any questions/concerns/comments! Coincidentally, the past several days there have been several professional activities that I have been involved in from the Dynamics of Disasters Symposium that I organized for the 2013 AAAS Annual Meeting in Boston that took place Sunday, February 17, to the hosting of Professor Tina Wakolbinger for a talk at the Isenberg School, with the great help of our award-winning UMass Amherst INFORMs Student Chapter. 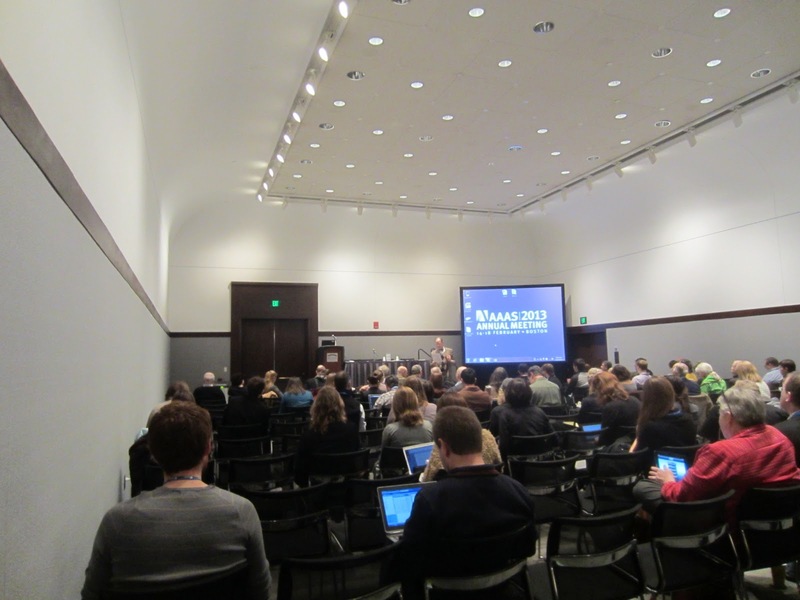 In the former, the new President of WORMS, Professor Laura McLay, was a panelist and also blogged about the experience, and Professor Tina Wakolbinger, who traveled all the way from Vienna, Austria, where she is a Professor at the Vienna University of Economics and Business, was a discussant (our photo at AAAS Boston is above). When we hosted Professor Wakolbinger for her seminar this past Tuesday, Professor Ana Muriel of the Department of Mechanical and Industrial Engineering at UMass Amherst, who is a past President of WORMS, came to the lunch, reception, and presentation, along with a nice group of her students. And, I might add, Professor Wakolbinger is a past Senior VP of Communications of WORMS! When family members get together, whether for holidays or other occasions, these are, typically, special events. Who isn't happy to see one's child return from college for a break, from a trip abroad, or even from summer camp? Today, we hosted one of my former doctoral students at the Isenberg School of Management, Tina Wakolbinger, who received her PhD with a concentration in Management Science in 2007 from UMass Amherst. After receiving her PhD she became an Assistant Professor at the Fogelman College of Business and Economics at the University of Memphis in Tennessee and less than 4 years after, became a Full Professor at the Vienna University of Economics and Business in Austria. She is also the Head of the Research Institute on Supply Chain Management there. She skipped the "Associate Professor" part in the usual progression in academia of Assistant Professor to Associate Professor and then, hopefully, promotion to Full Professor. Since I was the chair of Tina's doctoral dissertation committee, I am her academic "Mom." She was my 13th PhD student (in her case this was a very lucky number). Tina was in Massachusetts for the Dynamics of Disasters Symposium that I organized for the AAAS Annual Meeting in Boston and she very much wanted to come back to her alma mater. So, yesterday we drove back from Boston and she checked into the Campus Center hotel in the middle of UMass Amherst. She really enjoyed the spaciousness and comfort of the room. We dined at Arigato in downtown Amherst, since that is where she went to celebrate after getting the job offer from the University of Memphis. It was really pleasant to stroll through downtown Amherst and to see what had changed in the past 6 years since she received her PhD. 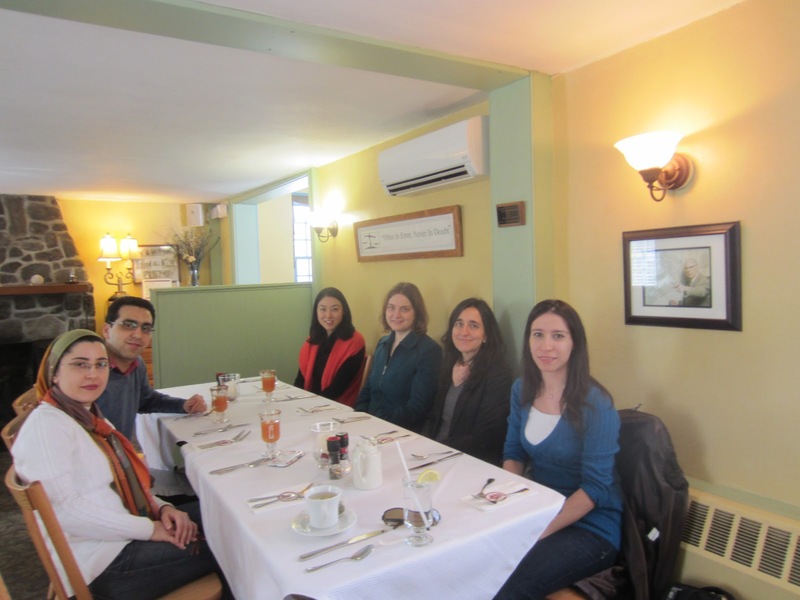 Today, we had a celebratory lunch in honor of her visit at the University Club. We took some photos in the Supernetworks Lab, where Tina also had an office as a PhD student. 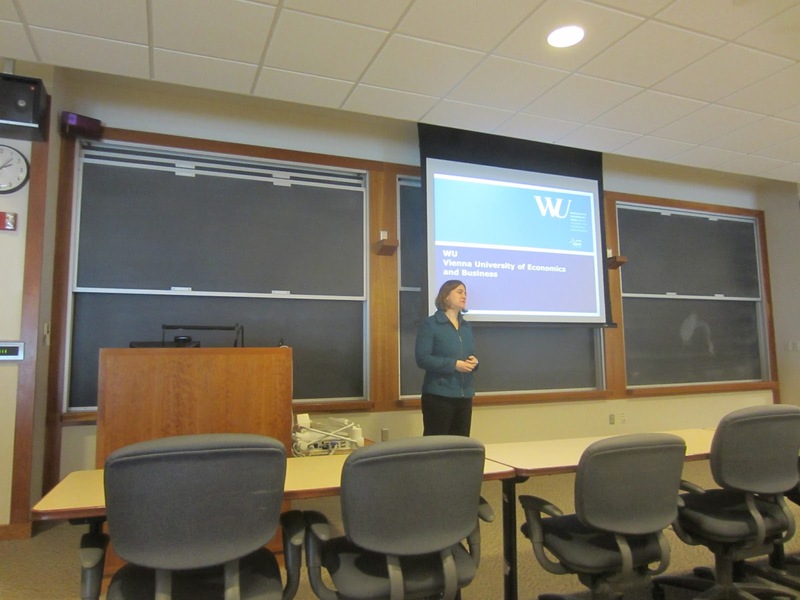 Then it was time for her seminar: The Value of Information Systems for Product Recovery Management, which was based on a paper that she had co-authored with Fuminori Toyasaki and William Kettinger and which was just published in the International Journal of Production Research. 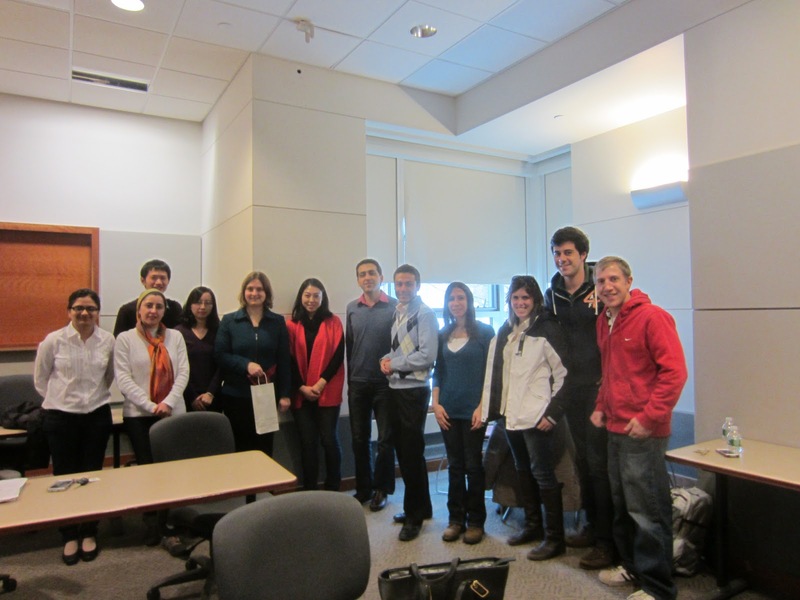 Her talk was hosted by me and the UMass Amherst INFORMS Student Chapter and the attendance was great.Tina had been the former President of this Student Chapter and received the Judith Liebman Award from INFORMS for her terrific work. She also helped me with the Speaker Series and we used Room 112, which was the (revised) venue for her talk today, so the site was perfect. We had a reception before the talk. After her fabulous presentation, in which she discussed models that she and her co-authors developed that quantify under what conditions investments in Information-intensive Product Recovery Systems (IPRS) are economically justifiable for manufacturers and when policy-makers need to consider facilitating their implementation.She focused on PCs as an example and discussed different frameworks in different countries in Europe (whether centralized collection strategies were used or decentralized ones). 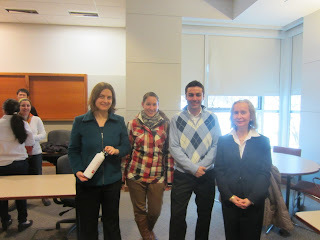 After the talk, we took some more photos and presented Professor Wakolbinger with a gift from the Isenberg School. Then it was time to put Professor Wakolbinger on the Peter Pan bus since she was off to visit another former doctoral student of mine, Professor Jose Cruz, who is a tenured Associate Professor at the School of Business at UConn. 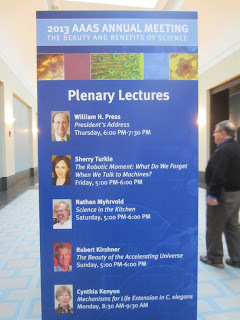 She will be giving a talk there tomorrow. The 2013 AAAS Annual Meeting in Boston, which took place February 14-18, 2013, is now over and it was an intellectual feast. The venue at the Hynes Center was perfect, given the frigid temps. 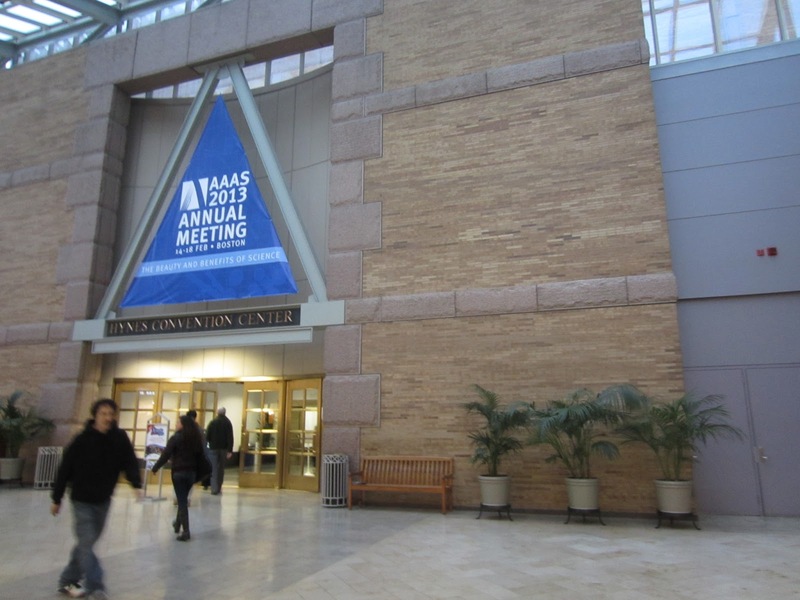 The photos below were taken at the AAAS meeting with the majority at the symposium that I organized: Dynamics of Disasters: Harnessing the Science of Networks to Save Lives, which took place on Sunday, February 17. All the panelists and discussants showed up -- as the organizer of this symposium, I breathed a sigh of relief, since the weather was unusually windy and cold and there was even some snow accumulation. Although we did have a technological disruption during Professor David McLaughlin's talk, once we located a technician, the issue was resolved. The symposium consisted of 3 panelists and 2 discussants with the former delivering 20 minute presentations, and the latter 10 minute ones. The perspective was multidisciplinary with engineering, operations research and management science, computing, applied mathematics, and even economics represented by the panelists and discussants (sometimes under one hat). We heard about radar placement and tornadoes, emergencies and snowstorms, evacuation networks under disruptions, material convergence and congestion post disasters, and the location of disasters world-wide. Jose Holguin-Veras, Rensselaer Polytechnic Institute, who focused on disasters that he had studied from the earthquake in Haiti to the triple disaster in Fukushina and Tina Wakolbinger, Vienna University of Economics and Business, who provided an excellent overview of the symposium with an emphasis on humanitarian logistics. We had 1 or 2 questions after each presentation and then opened up the symposium to additional Q&A. I would like to thank the outstanding panelists: Professor David McLaughlin, who is also the Director of CASA (Center for the Adaptive Sensing of the Atmosphere) at UMass Amherst, Professor Laura McLay of the Department of Statistical Sciences and Operations Research at Virginia Commonwealth University, who wrote a blogpost on our symposium, Distinguished University Professor Panos M. Pardalos, who is an AAAS Fellow and an INFORMS Fellow, Professor Jose Holquin-Veras, William H. Hart Professor at RPI, and the Director of the Center for Infrastructure, Transportation, and the Environment, and Professor Tina Wakolbinger, Head of the Research Institute for Supply Chain Management, who traveled from the Vienna University of Economics and Business in Austria, for their scientific leadership on problems of great societal importance. Thanks also to Professor Ed Aboufadel and AMS for supporting our symposium. 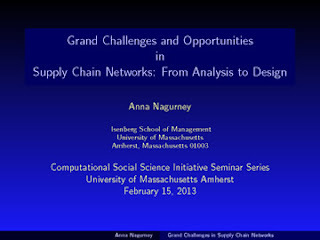 I had a great time giving a seminar yesterday on Grand Challenges and Opportunities in Supply Chain Networks: From Analysis to Design in the Computational Social Science Initiative Seminar Series at UMass Amherst. The presentation took place on the 9th floor of the Campus Center in the middle of the campus and the view was fabulous on a bright, sunny, and actually warm day in February. 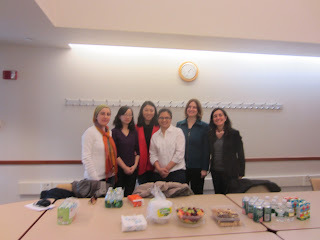 Yahoo is giving financial support for the seminar series and it was nice that lunch was provided by UMass catering. Several of my doctoral students from the Isenberg School of Management came and it was great to see sociologists, computer scientists, and engineers in the audience, as well. I focused on the importance of capturing the behaviors of the decision-makers in the context of supply chains and also overviewed the Braess paradox (classic (1968) version) and showed photos of Professor Braess visiting the Isenberg School, after our translation of his paper from German to English, along with Tina Wakolbinger, appeared in Transportation Science. I showed how we used evolutionary variational inequalities to demonstrate how the Braess paradox only occurred on the classic Braess network for a range of demands. This was work that I did while I was a 2005-2006 Fellow at the Radcliffe Institute for Advanced Study at Harvard University. My co-authors on this paper were Professor David Parkes of Harvard and Professor Patrizia Daniele of the University of Catania. The paper appeared in Computational Management Science. In addition, I had to mention our work on the integration of social networks with supply chains and with financial networks, as well as the evolution of the product flows, relationship levels, and prices over time. This was also work done with Tina Wakolbinger. Coincidentally, Tina Wakolbinger, who is now a Full Professor (I am so proud of my former students) is flying into Boston today to take part in the Dynamics of Disasters symposium that I organized for the AAAS meeting that is taking place in Boston, February 14-18, 2013. Our symposium will be at the Hynes Center tomorrow afternoon and I can hardly wait -- the panelists and discussants are simply superb -- Professor David McLaughlin, Professor Laura McLay, and Professor Panos M. Pardalos, with Professors Tina Wakolbinger and Jose Holquin-Veras as discussants. The questions from the audience at my seminar were really good (Thank you!) and ranged from questions on existence and uniqueness of solutions and multiple equilibria as well as stability analysis, ongoing and future research, as well as how the methodologies that we have been instrumental in co-developing (projected dynamical systems, for example) have migrated to different disciplines, including neuroscience. I had highlighted the wide range of supply chains that we had worked on from electric power ones with empirical results for New England to humanitarian and healthcare ones for critical needs products and pharmaceutical products, respectively, and blood supply chains. I even spoke on network synergies and assessment in the context of mergers and acquisitions. M&As have been big news lately with the American Airlines and USAir merger (still needs approval by regulators), Berkshire Hathaway and Heinz -- breaking related news on this one, and others, including Dell. I was also asked about our work on supply chains in nature, so I had the opportunity to speak on work that we have done with Professor Christian Mullon of France on the network economics of ecological systems with data from marine ecosystems. I mentioned his forthcoming book, which he graciously forwarded a recent draft of to me. The book, which should be available this July, is called Network Economics of Marine Ecosystems and their Exploitation, He acknowledges me in the book for "inspiration." To see network economics, variational inequalities, and projected dynamical systems being utilized in this novel application domain is simply thrilling. I concluded my lecture by showing by latest book, Networks Against Time: Supply Chain Analytics for Perishable Products, hardcopies of which had arrived on Valentine's Day, to the audience. Special thanks to Professors Ryan Acton and James Kitts for the great hosting! Networks Against Time -- Our New Book is Published! 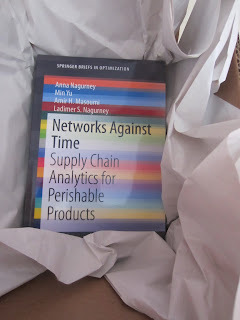 Yesterday was not only Valentine's Day, but it was also the day that the first shipment of our new book, "Networks Against Time: Supply Chain Analytics for Perishable Products," published by Springer, arrived. The book had already been posted online, in chapter format by the publisher, but the feeling, filled with expectation, of opening the box and then unwrapping the packaging to see the finished product, over which we had labored hard and long, was very special. Writing a book is like giving birth (I guess that only females can use this analogy). You hope that, when the time comes, the "child" is healthy and will be with you for a long time. It also takes teamwork -- my co-authors: Min Yu, Amir H. Masoumi, and Ladimer S. Nagurney, made this multidisciplinary approach to supply chains ranging from food to pharma to fast fashion to medical nuclear supply chains and even blood supply chains possible. The journey of this book, in terms of production, was filled with suspense, since it was emailed in electronic format to the publisher in NYC and then Superstorm Sandy struck, and the Springer offices were without power. I did not even dare to ask about the flooding (the address is on Spring Street). After a few days, I received an acknowledgment that the offices would reopen. Then, after copyediting, which required some transcontinental communications, and the correction of the galleys, it was time for production, both virtual (website-based) and physical. Those of you in the Northeast know that we are still digging out from Blizzard Nemo, so, clearly, there were delays in deliveries because of the road and travel conditions. This is my 10th book and whether it is your very first or n-th, the feeling of accomplishment is satisfying. The Supernetworks book that I wrote with June Dong and was published by Edward Elgar in 2002, was sent to our publisher in the United Kingdom just before 9/11. In those days, we did camera-ready copies on special paper, and the parcel that I had mailed was at the JFK airport until flights were allowed to resume. The Networks Against Time book I dedicate, posthumously, to my amazing uncle, Mr. Stanley E. Jarosz, who at age 92, was still working for a bridge engineering firm in Manhattan, living on 57th Street, and regularly going to concerts and operas at Lincoln Center. He was a refugee from Ukraine and fled during WWII to Vienna and made his way to the US. He died on February 13, 2013. Several of the bridges that he designed in the US received major awards. He had also been a licensed pilot -- the love of transportation and logistics must be in our family's genes. In the last conversation that I had had with him -- he was not even ailing and, just over the past several days, required hospice care -- he asked me when I was going to write another book. I told him that my 10th would be out soon. He died in Colorado, with his son looking over him. He had moved from Manhattan seven months ago after retiring and missed work tremendously. That night, I could not sleep for several hours -- unknowingly -- and coinciding with his passing. We had spoken with his son (my cousin) only hours before and I thought that my uncle would still be with us for a week or so. Uncle Stanley (or Stacho as we called him in Ukrainian), this book is for you! 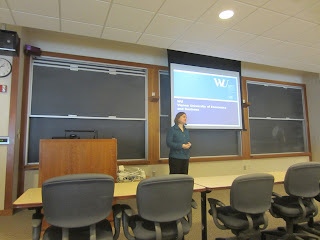 Today, I will be speaking in the Computational Social Science Seminar Series at UMass Amherst and I had a deja vu. When my dissertation advisor, Professor Stella Dafermos, who was the first female professor at Brown University in the School of Engineering and the Division of Applied Math (and for the historians of science out there -- also the second female to receive a PhD in Operations Research in the world) passed away, I was a Visiting Scholar at the Sloan School at MIT. I received the news of her passing in a phone call from her husband and that very afternoon I gave a talk in the Operations Research Center seminar series at MIT. Not easy, but such mentors as Stella and my uncle Stanley, who demonstrated remarkable resilience, and true intellect, taught us well. 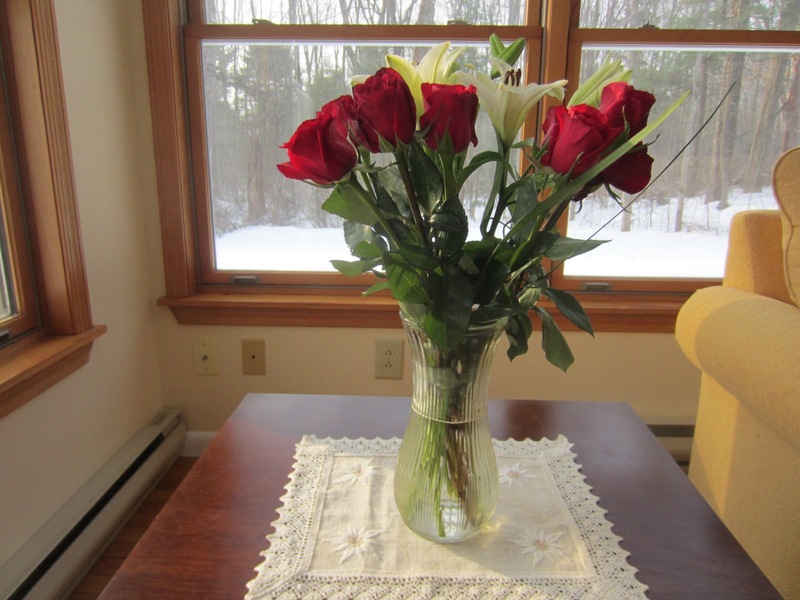 And I did receive the lovely bouquet of flowers pictured below yesterday as well. You may be expecting me to be writing about math models, algorithms, and love since tomorrow is Valentine's Day but, given Professor Laura McLay's post on such a topic, I am writing on another one -- that of the breakup of my department into two separate departments. This divorce did not need a judge or court or lawyers, but it needed the Faculty Senate and, on January 31, 2013, the separation of my department at the Isenberg School of Management was made official according to this document. So, now we have not a single department housing what I always liked to think of as the real techies in our business school but two separate departments: the Department of Finance and the Department of Operations and Information Management. The day to day rhythms should not change much and we still will have the same wonderful secretary. So, now it will be time for new business cards, new stationery, new updates to the cv's, and various websites, as well as new signs around the school, etc. I am very pleased that our undergraduates will now have separate majors upon graduation with their degrees (having a major in Finance and Operations Management was confusing to some employers). The doctoral track remains Management Science for "our" department. 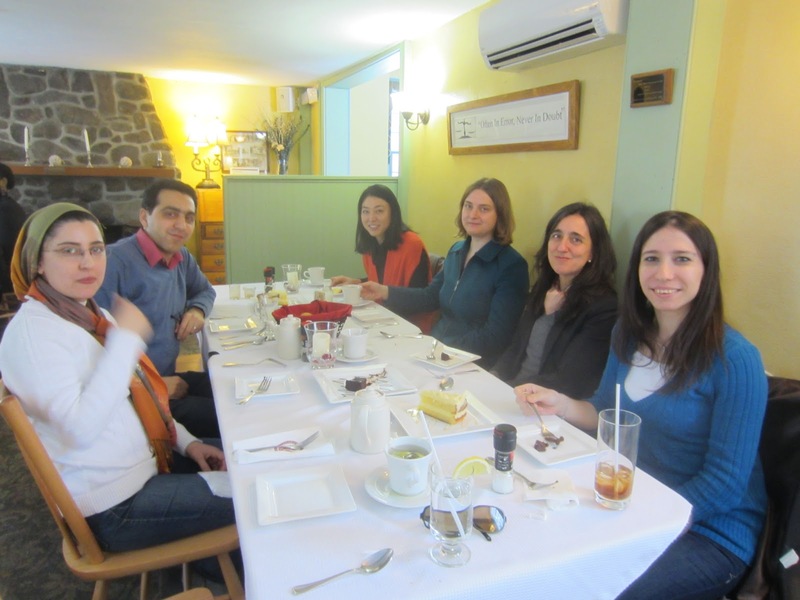 Nevertheless, I will miss having stronger ties with the Finance faculty but the friendships remain as well as the collaborations, whether through grants, research, and/or even serving on students' doctoral dissertation committees. And I will continue to work on Financial Networks, which is the theme even of a special issue of the journal, Computational Management Science, that I am guest editing. Then, with colleagues from Computer Science, and Electrical and Computer Engineering, as well as a few other, I wrote a proposal for new faculty in the area of cybersecurity and our department got a new faculty slot, and we ended up also getting a spousal hire, as well, so the non-Finance part grew. It made sense to then add "Information Management." Amazingly, the proposal that we wrote for a cybersecurity cluster hire is still online. Change happens in academia, albeit slowly, but change is good. We are now in the midst of interviewing faculty candidates so these are exciting times. The college early decisions and early actions were mailed out just a few weeks ago and there are happy high school seniors and also disappointed ones (some very). So many students, parents, maybe even grandparents, siblings, and other relatives think that the be all and end all is to get into and matriculate at an Ivy League university. This comes from families who may have had several generations go to an Ivy League university as well as families whose parents are immigrants and/or the high school seniors may be immigrants as well and to other high achieving and ambitious hardworking students. I thought that I would put this into perspective, realizing that, for some, who have worked so hard academically and on their extracurricular activities, not to mention studying for the SATs, writing those college application essays, going on interviews, etc., that being deferred, or rejected, is emotionally and, perhaps, even, physically, painful. Here are the data and the facts: you do not need an undergrad degree from an Ivy League university to become President of one. In fact, you may not even need even a graduate degree from an Ivy League university to become President of one. Dr. Shirley Tilghman, the President of Princeton University, who has served since 2001 (and will be stepping down at the end of this academic year with no announcement yet as to her replacement) was born in Canada (as was I ) and she has an undergrad degree from Queen's University in Kingston, Ontario, Canada and a PhD from Temple University of Philadelphia. Dr. Christina Paxson, the new President of Brown University (my alma mater 4 times over), received her undergrad degree from Swarthmore in Pennsylvania (and she even jokes about how quickly her rejection from Harvard University came when she applied there as an undergraduate). Her PhD is from Columbia University. Dr. Drew Gilpin Faust, who I have written about because I was a Radcliffe Institute for Advanced Study Fellow at Harvard University, when she was the Dean of the Institute, and, the year after, became President of Harvard, received her undergrad degree from Bryn Mawr College in Pennsylvania (there is something special about those eastern Pennsylvania liberal arts colleges, you must admit). Her PhD is from the University of Pennsylvania. Dr. Amy Guttmann, the President of the University of Pennsylvania, whom I have also written about, received her undergrad degree from Radcliffe College (now part of Harvard), a Master's from the London School of Economics, and her PhD from Harvard University. Now, information on the male Presidents of the 4 other Ivy League universities. Lee Bollinger, the President of Columbia University in NYC, has an undergrad degree from the University of Oregon and a law degree from Columbia. Dr. David Skorton, the President of Cornell University, has an undergrad degree from Northwestern University in Evanston, Illinois, as well as an MD degree from there. Note -- no Ivy League degrees and still heading Cornell for many years. Dr. Philip Hanlon, the incoming President of Dartmouth College, graduated from Dartmouth but received his PhD from CalTech. 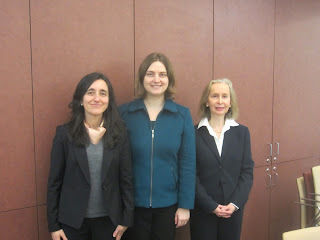 His dissertation advisor was Dr. Olga Taussky-Todd and I used one of her theorems in my doctoral dissertation. Dr. Peter Salovey, the incoming President of Yale University, has a pedigree very similar to that of the outgoing President of Yale, Dr. Richard Levin: Stanford undergrad and Yale PhD. Levin also has an undergrad degree from Oxford University and Salovey has several master's degrees from Yale. So there you go -- you don't need an Ivy league undergrad degree to become President of an Ivy League University! In fact, two out of the eight sitting Ivy League Presidents don't have a single Ivy League degree! Leadership is earned and there are many outstanding colleges and universities in the United States, both public and private, where you can obtain an elite education. It is entirely up to you to take advantage of the great courses offered and other opportunities. Do remember and recognize the great mentors, faculty, staff, and family members that support our students. 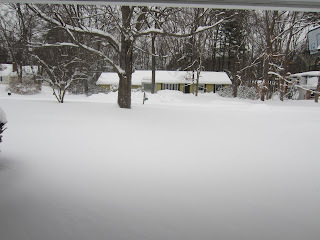 We got plowed out in Amherst, Massachusetts so I went for a walk in our neighborhood and saw more neighbors outside shoveling with children playing than I have seen out in a long time. 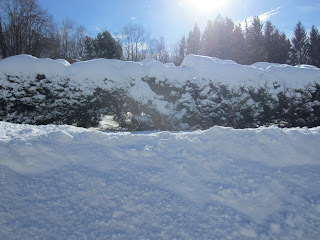 The sun has come out and Governor Deval Patrick has lifted the travel ban in Massachusetts as of 4PM today. This was a 24 hour travel ban. The UMass Amherst men's basketball game is still on (moved to 7PM as I had written in my earlier post) but it will not be televised on ESPN2 but will be streamed on ESPN3 instead. 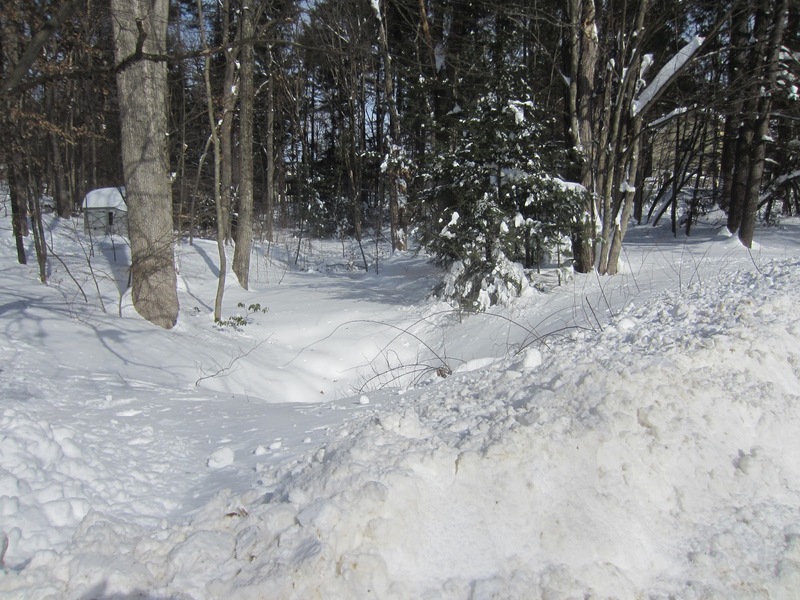 Relatives in eastern MA and Rhode Island are still without power and it will be frigid tonight. I took the photos below in our neighborhood a short while ago. We are now seeing what Blizzard Nemo has wrought: havoc, with power out to hundreds of thousands, including the Plymouth nuclear power plant, which was shut down, travel on roads in Massachusetts still banned by the governor, except for emergency vehicles and news services, businesses and schools closed (from UMass to MIT and more). And, mail is suspended for all 6 New England states today. Special thanks to all the emergency crews and the crews who are trying to get our roads to be passable again as well as to the electric power crews who are working on restoring electricity. Amazingly, the UMass Amherst men's basketball game is still to take place but the time has been moved from 2PM to 7PM. The game is being nationally televised by ESPN2 but you might have to snowshoe there (I am very tempted to hike to support the players and their great coach, Derek Kellogg, who lives close to us). ALERT: The University of Massachusetts Amherst campus is closed until 12 noon today, Saturday, Feb. 9 (and closed yesterday at noon). BUS SERVICE: There will be no bus service today, Saturday, Feb. 9. 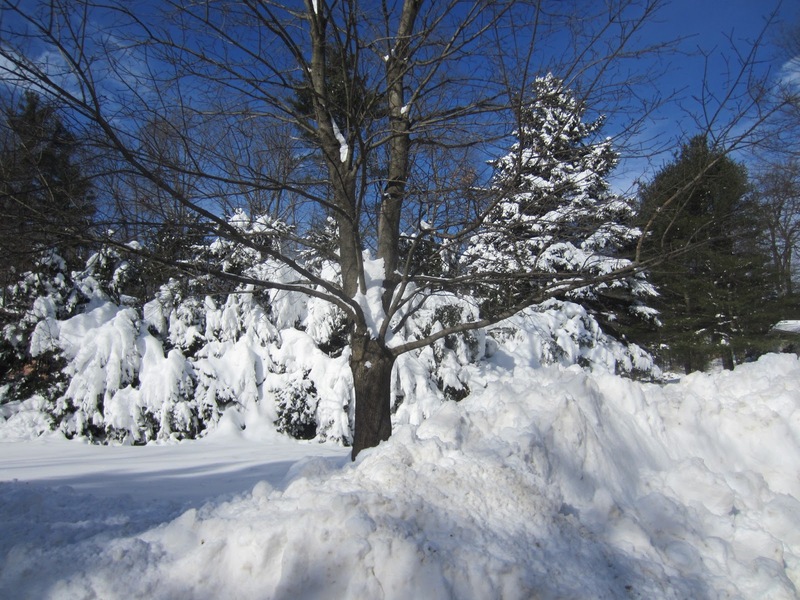 UHS: Walk-in clinic is open for usual weekend hours of 11 a.m. to 5 p.m.
TRAVEL BAN: Due to the snowstorm, Massachusetts is currently under a state of emergency and use of all non-essential vehicles is banned. As a result, anyone with tickets for the men's basketball game vs. Saint Joseph's in the Mullins Center on Saturday cannot drive to the game. If the driving ban is lifted before the 7 p.m. game, conditions may still remain hazardous and snow-removal efforts will be slowed by substantial traffic. Tickets for this game may be exchanged for a future contest. The winds are still howling and we took the photos below of the periphery of our home this morning. The photo below was taken of our backyard on Thursday, just as the dire forecasts for nemo were reaching a crescendo. What a difference the blizzard has made. It has brought most economic and other activities to a standstill. And with over 5,000 flights cancelled since Thursday the disruptions are major. The news and associated warnings about the blizzard that is supposed to wallop New England, beginning tomorrow morning and lasting through Saturday is being described as "epic" and "historic." 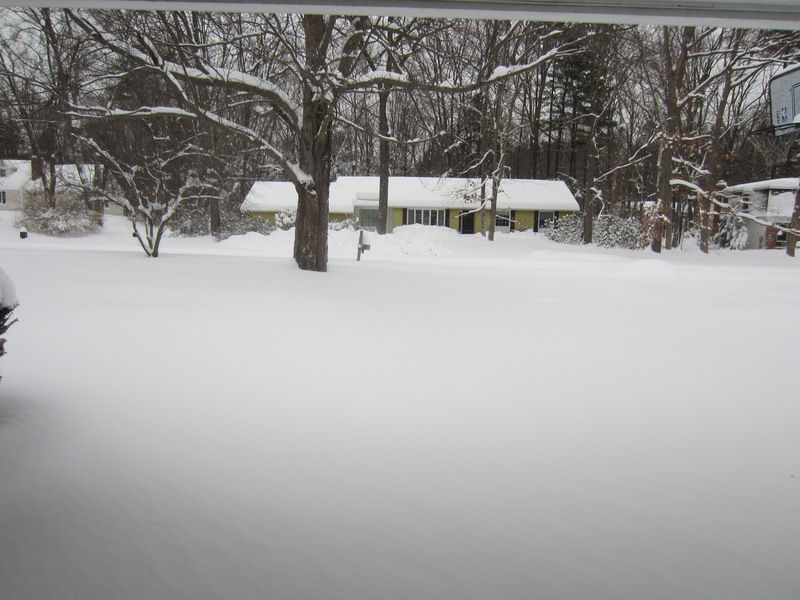 We just received a phone message from the Amherst Town Manager, who is also a neighbor of ours, to prepare accordingly and even our Massachusetts Governor has issued warnings. The weather reports are noting that parts of Massachusetts and Connecticut may receive over 2 feet of snow with the Boston area forecasted to be especially heavily hit. Winds up to 60 miles an hour are also being predicted. I have been receiving messages of concern from collaborators outside of the Northeast -- thank you! There are also comparisons (we will see) being made to the blizzard of 1978, with the 35th anniversary falling yesterday. I have been working on my lectures for an intensive short course that I will be giving at the Vienna University of Economics and Business in Austria in mid-March. The topic of the course is Humanitarian Logistics and Healthcare. I taught a full semester course on the topic in the Spring of 2012 at the Isenberg School of Management. When I was invited to be a Guest Professor in Vienna (I am on sabbatical this year and am spending a lot of time at the University of Gothenburg in Sweden) I was asked to suggest a few course titles and the above one was the one selected. The audience will be international, I have been told, but since the setting is Europe, I have been updating my lecture notes and slides. A lot has happened this past year, Superstorm Sandy, to start, and it is always interesting to put a fresh spin on course lectures for different audiences. 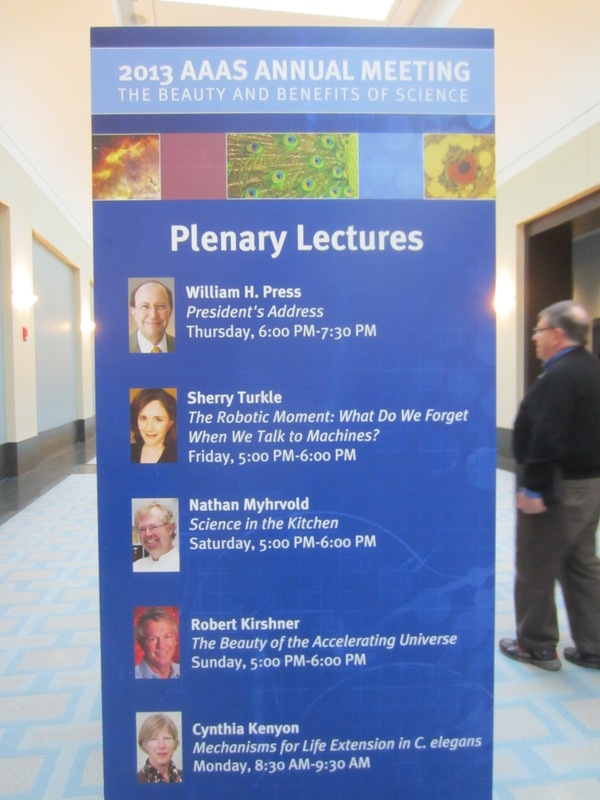 Coincidentally, late next week, the AAAS meeting in Boston is taking place, and at the symposium that I organized entitled, Dynamics of Disasters, the audience will get to hear some fabulous researchers and speakers: Dr. David McLaughlin, Dr. Laura McLay, Dr. Panos Pardalos with Dr. Tina Wakolbinger and Dr. Jose Holquin-Veras as discussants. More information is on the AAAS website. Let's hope that there won't be any travel travails! Stay safe, everyone, and pray that the power stays on and that there is no major damage or flooding! Also, check on your neighbors -- WebMD has some useful tips. Many universities and colleges have already announced that they will be closed tomorrow -- the same holds for many school systems. Every year, around this time, the National Academy of Engineering (NAE) announces its newly elected members. The official announcement is to take place at 10AM today but I like to do research and have uncanny intuition and caught that the NAE website in its Members Directory has already posted, by name, the 2013 newly elected members. The link to the 2013 list is here and the names are in alphabetical order. If there is a problem with the link just click on the 2013 year and you will see the list as I did. Congratulations to all those on the list! There are quite a few representatives from industry and a few female names on the list. How many names do you recognize? Do you know any personally? Last year, I wrote a post on knowing several elected to the NAE in 2012. In my previous post, I wrote about how to construct a great model with insights from Dr. Hal Varian, the Chief Economist of Google, who had also spent many years at UC Berkeley. I noted that the doctoral dissertation defense of my 17th PhD student would soon be taking place. Indeed, I had chaired 16 doctoral dissertations to that point and am very proud of my former students! So, for all of those out there who are dying of suspense as to the outcome -- the news is great! Amir H. Masoumi successfully defensed his doctoral dissertation on Friday, February 1, 2013 at the Isenberg School of Management at UMass Amherst. His concentration was Management Science and the title of his dissertation: Supply Chain Management of Perishable Products with Applications to Healthcare. In his research, he focused on centralized and decentralized supply chains with the former consisting of blood supply chains and the latter -- oligopolistic competition with brand differentiation of pharmaceutical products. His work is also related to medical nuclear supply chains and to food supply chains. Coincidentally, after his defense, he told me that his lucky number has always been 17! His dissertation committee consisted of Professor Hari Balasubramian of the Department of Mechanical and Industrial Engineering at UMass Amherst, Professor Senay Solak of the Isenberg School, and Professor June Dong of the School of Business of SUNY Oswego. What really impressed me was not only how Amir thanked his fellow associates at the Virtual Center for Supernetworks that I direct but also how he acknowledged his colleagues at the award-winning UMass Amherst INFORMS Student Chapter, many of which showed up on a freezing Friday afternoon to listen to his presentation and waited outside the room until the committee finished asking him their questions. Later, that evening, we celebrated his successful defense at Moti, a Persian restaurant in downtown Amherst. The food was delicious and the conversations had us roaring with laughter. Thanks to all those who have supported a student in his journey to achieve his dream of becoming Dr. Amir H. Masoumi! And, yes, his mother, back in his birthplace, had been praying for him all day and, when he texted her at 1:30AM her time with the good news, she was very relieved and very happy!